How To Connect iPhone to Hisense TV? Home More Top Tips How To Connect iPhone to Hisense TV? Hisense TV is the most popular and best budget smart TV. Hisense smart tv is offering the best 4k, Full HD and HD quality pictures. If you want to iPhone screen mirroring on Hisense smart tv. But, you don’t know how to connect iPhone to Hisense tv. You can read this article for solving your how to connect iPhone to Hisense tv problems. A lot of options available for connecting your iPhone to Hisense smart tv such as cast to Hisense smart tv via HDMI cable and ios apps. You can choose anyone options for casting your iPhone screen mirroring to Hisense TV. You can follow the below steps to connect iPhone to Hisense tv. I think you have an HDMI-to-Lightning adapter. This adapter has two ports such as one port for iPhone Lightning and another female port for HDMI cable. Note: You can use an alternative option such as digital media devices (Like Roku, Chromecast, Apple TV and Amazon Fire Stick). These media devices help you connect your iPhone to Hisense Smart TV by using the official apps of the devices. Connect the Adapter’s Lightning end with your iPhone. After that, you can connect your HDMI cable to your Hisense Smart TV’s HDMI Port and your Adapter’s HDMI Port. Take your Hisense TV Remote and press on the Input Button. A list of all available input source display on your TV’s screen. After that, You can select the HDMI Port option for your iPhone screen mirroring to Hisense tv. Select your iPhone device with the help of arrow keys and press on the Enter Button on your Hisense Smart TV remote. Now your iPhone will connect to your Hisense tv. TV Assists apps help you for connecting your iPhone or screen mirroring on Hisense tv. You can easily stream your favorite videos, audio files and movies on your Hisense Smart Tv with help of TV Assist App. 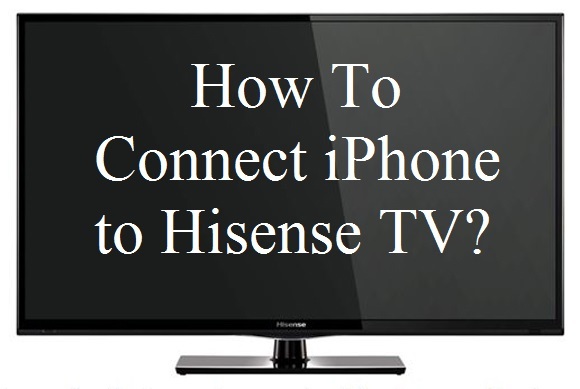 If you want to know or learn how to connect iPhone to Hisense TV then follow the below steps. Firstly, download the TV Assist apps from App Store and Install it on your iPhone. After installing, you can launch your TV Assist ap on your iPhone. Verify your iPhone and your Hisense smart tv connected wirelessly before use this app. If connected with wifi then you can use your iPhone, iPad or iPod device to run the TV Assist app and open your favorite media file for casting on your Hisense Smart TV. AirServer app also helps for screen mirroring your iPhone to your Hisense Smart TV. You can follow the below steps for how to use the Airserver App for connecting the iPhone or iPad or iPod device to Hisense Smart TV. Download the AirServer app from the App Store and install it. Take your iPhone or iPad or iPod device, Go to Control center and select the Screen Mirroring. After that, you can select the name of your iPhone and your Hisense smart tv for casting the iPhone or iPad and iPod device screening mirroring on your Hisense tv. Previous articleWhy Does My Vizio TV Turn On and Off By Itself? Next articleHow To Program Dish Remote To Vizio TV?